Hello and a warm welcome to our latest post. 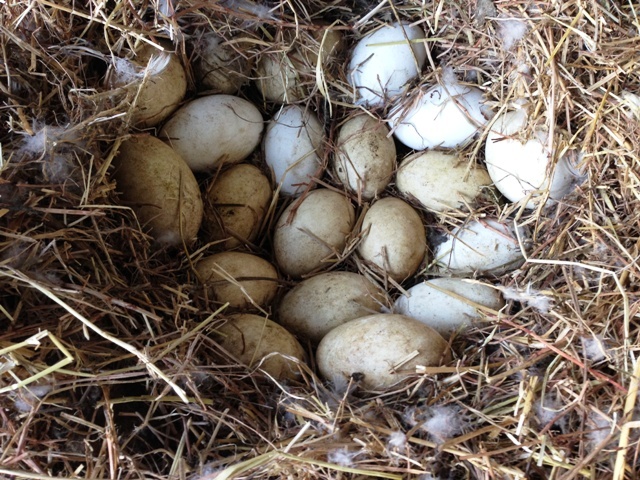 Every year here at the Tree Of Love Resort our geese come up to our cattle pens to make nests for their eggs. Its always a very noisy time. In fact they keep some of our Wwoofers awake with all their noise. 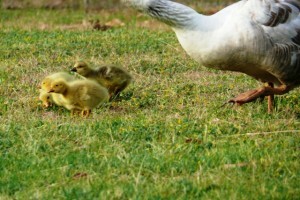 Geese mate in water and then lay their eggs one at a time. So it takes them quite a few days to do this. They seem to lay one egg a day…then they carefully cover up their eggs with hay and feathers to hide them from predators. They are very protective over this period. They hiss at you if you get to close. Last night as I was locking them up for the night and there were four baby chicks outside of the pen. So I scooped them up and took them to the gate and put them inside…but then mum came at me very fast and she chased me until i could close another gate to stop her. Then she turned around and chased my dog. Boy it gets your heart pounding being chased by a angry goose. My dog is a little Maltese so the goose is twice the size. I wondered if it scared her.I guess it did.! The first few weeks are always a worry to us with our baby chicks. We get lots of foxs here and they know the chicks are around. We have already lost a few. We also have chicken hawks that scoop down and fly away with them. Its a dog eat dog world when your a wild animal.! Other news and updates! November is a time for hay making….this year we have huge amounts of grass…….all the farmers are reporting lots of hay…so this is all done now and the next job is to take these hay bails and cart them to the place they will be stored for winter. We have started picking/ packing avocados…so these are mostly going over east. The avocados are in flowering mode right now. Its a little bit of a worry due to the weather. We are meant to have at least 5 consecutive days of warm nights but we havent had this…..our weather has been in the last week ranging from 30 degrees to 5 degrees overnight with hot sun- strong winds, and hail. 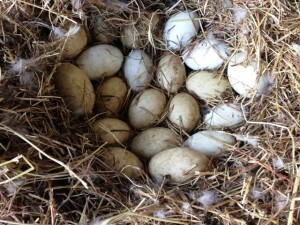 This entry was posted in Tree Of Love Farm and tagged Geese Avocadoes. Bookmark the permalink.